MOSCOW ? Vladimir Putin told Russian diplomats that he made a proposal to Donald Trump at their summit this week to hold a referendum to help resolve the conflict in eastern Ukraine, but agreed not to disclose the plan publicly so the U.S. president could consider it, according to two people who attended Putin?s closed-door speech on Thursday. Details of what the two leaders discussed in their summit in Helsinki remain scarce, with much of the description so far coming from Russia. While Putin portrayed the Ukraine offer as a sign he?s seeking to bring the four-year-old crisis to an end, a referendum is likely to be a hard sell with Ukraine and its backers in Europe, who remain committed to an 2015 European-brokered truce deal for the Donbas region, parts of which are controlled by Russian-backed separatists. White House officials didn?t immediately respond to a request for comment. If Putin?s account of Trump?s reaction is accurate, it would suggest a more flexible approach than the U.S. has shown to date on the issue. At the Helsinki meeting, Trump also agreed to consider a Putin request to question the former U.S. ambassador to Moscow over U.S. campaign-finance violations that critics say Trump should have dismissed outright. 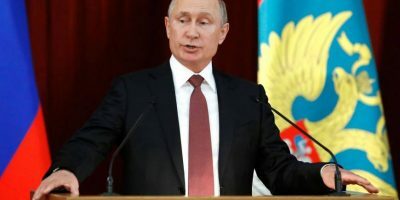 Putin gave his latest account of the meeting during at a conference with top Russian ambassadors and officials at the Foreign Ministry in Moscow, the people said, asking not to be identified discussing the president?s comments to the part of the session that was closed to the public. One of the people said that Trump had requested Putin not discuss the referendum idea at the press conference after the summit in order to give the U.S. leader time to mull it. Putin?s proposal would call for a vote conducted under international auspices by the residents of the separatist territories on their status, the people said. Kremlin spokesman Dmitry Peskov declined comment on the details of what Putin said about Ukraine at the summit, saying only, ?Some new ideas were discussed. They will be worked on.? On Twitter Thursday, Trump called the summit ?a great success? and cited Ukraine among the areas discussed, without providing details. Putin?s proposal will alarm Ukrainian officials after Trump last week appeared to leave open the possibility of recognizing Russia?s 2014 annexation of Crimea, which triggered the crisis that led to fighting in eastern Ukraine?s Donetsk and Luhansk regions. Ukraine has offered the areas autonomy under its rule and backs the deployment of international peacekeepers in the region. Putin pointed to a 2014 referendum, which wasn?t internationally recognized, that was held in Crimea to justify Russia?s annexation at his press conference with Trump after the summit in Helsinki on Monday. ?We believe that we held a referendum in strict compliance with international law,? he said. ?This case is closed for Russia.? Leaders of so-called rebel republics in Donetsk and Luhansk held referendums in May 2014 that declared independence. The votes were rejected as illegal by the U.S. and the European Union, while Ukraine called them a ?farce.? Russia said at the time that it ?respects? the votes, which showed as much as 96 percent support for breaking away from Ukraine. If a referendum was held in rebel areas of eastern Ukraine, ?the result would be the same as in Crimea,? which voted to join Russia, Igor Plotnitsky, who was then leader of the self-declared Luhansk People?s Republic, told Russian state-run RIA Novosti news service in March last year.